Long before I began to research color I realized that specific pairs of colors mutually enhance one another. This was because in my youth in England when I used to paint color coordinated plaster pixies to sell for extra pocket money, I found that certain combinations such as blue and yellow, were particularly pleasing. These same color pairs are what I now call "visual complements" though I didn't know them by that name in those days! My later experience as a painter, and research for my books led me to question the prevailing literature on the subject. It has become clear to me that there are not just one set of complementary color pairs but two sets. 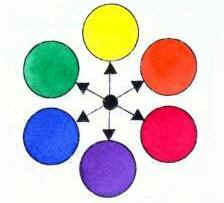 These are required for the two separate functions of color mixing and color enhancement. The colors of the two sets are definitely not the same though most artists are unaware of this. How about you! 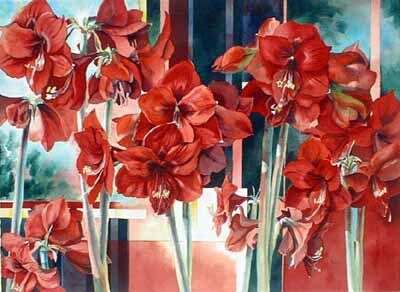 The good news is that if you use the right visual complements, the color in your paintings will be more exquisite and dazzling than ever before. 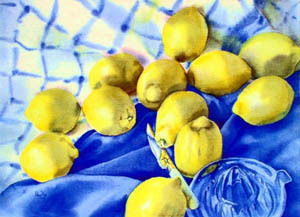 Lemon yellow appears much more vibrant when surrounded by its "visual" complement which is blue. 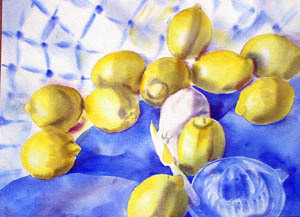 Most artists erroneously pair yellow with purple for color enhancement which is related to the way the eye works (lateral inhibition and disinhibition). So let's take a moment here to get down to the basics. A complement is "that which completes". What do MIXING and VISUAL complements complete that makes them fundamentally different? 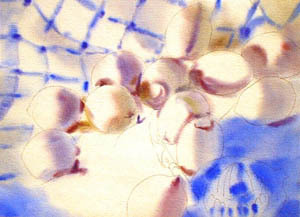 "Mixing" complements complete the subtractive color mixing process. "Visual" complements complete the optical synthesis which is bound by the way our eyes work. Thus I coined the names "mixing" and "visual" complements to pertain to these two processes. The actual color pairs are determined because they complete the optical synthesis in which the eyes equalize reflected light from a painted surface when viewed. Only the right pairs will produce a COLORLESS GRAY when painted in the correct proportions either on a disc and spun, or as dots as in Pointillism. Fortunately we don't have to go through this arduous process! The color pairs have been quantifiably established by Ellen Marx in her incisive book "Optical Contrast & Simultaneity" (1983 Van Nostrand Reinhold Company Inc). The corresponding pairs of artists' colors are listed below and shown in the vertical chart created for the Daniel Smith article. You will need to use precise colors for optimal color enhancement. Note that the colors of "visual" complements correspond to the colored "light" complements that complete the additive synthesis of adding colored lights. The right pairs when shone together yield WHITE light. Here are the color pairs that I use for color enhancement. . If your favorite color is not listed, find the nearest visual complement that you can find! It is important to use the precise paints listed to achieve optimal color enhancement. Thus I have used the color index name such as PY175 (included on paint tubes) so that you can match the exact paint listed no matter which brand you are using. The brands that I have used are Daniel Smith and Winsor & Newton paints. Click here to link to WCO'S manufacturers' page. 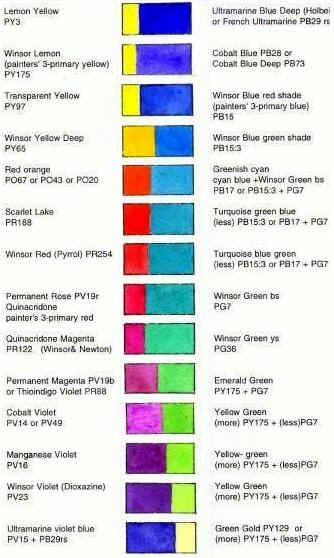 Here is a copy of the color chart. The proportions show the approximate amount of each color it would take to make the requisite colorless gray if spun on a disc or painted as dots as in Pointillism. Only color pairs that are visual complements will make light gray if blended in this way indicating that if painted contiguously each will appear more vivid and colorful to the viewer. The confusion was sustained by Michel-Eugene Chevreul , a French chemist and color theorist who, unlike Goethe, did indeed understand the difference between subtractive and optical/additive color. In his book "The Principles of Harmony and Contrast of Colors and their Application to the Arts"(1839) he offered a wheel showing complementary pairs and specifically stated that this was for color modification "upon the eye", and not for paint mixing. However, since he used the same colors pairs as Goethe, he continued the error. For instance, he used red/green instead of red/ turquoise, blue/orange instead of cyan/orange, and yellow/violet instead of yellow/blue for color enhancement. These color combinations were then erroneously used by many of the French Impressionist painters as well as fashion, garden and interior designers of that period and to this day. Ogden Rood in "Modern Chromatics" (1879) named the correct "visual" complementary contrast colors- pairs that he called "companions" that when juxtaposed glowed "with more than their natural brilliancy". Unfortunately, he failed to articulate that there was a difference between "visual" and "mixing" complements. And so the confusion continued- until today when I hope this article has sorted out the mess for you! Let me know! hpage2@houston.rr.com. You might be interested in my video on Visual Complements . Also in my three art books published by Watson-Guptill publications. My books are "Color Right from the Start", "Hilary Page’s Guide to Watercolor Paints" and "Watercolor Right from the Start". Signed copies are available from this site. See the orderform.